Rutland, Vermont, Will Soon Be the New Home to 100 Syrian Refugees. How Will a Divided Community Embrace Them? The small city is struggling to figure out who it is and just how welcoming it wants to be. Around the second week of January, a group of refugees will arrive in the city of Rutland, Vermont. They will most likely be Syrian. They will most likely be Muslim. They will most likely be families of three or four: a father, a mother, one or two children. They will be the first Syrian refugees in Vermont; the first official refugees, period, in Rutland. The plan is for the refugees to be welcomed at an airport, most likely Burlington International, by a nervous but eager committee. There they’ll meet Amila Merdzanovic, the director of the Vermont Refugee Resettlement Program (VRRP)—once a refugee herself, from Bosnia. Rutland’s mayor, Christopher Louras, will also be there. And so will a crowd of people from a group called Rutland Welcomes. These are their new neighbors. The ones, at least, who want them there. As they drive into Rutland, the refugees will glimpse three church steeples and a handful of simple houses that rise up from a small valley, gently nestled between snow-flecked mountains. They’ll pass yards dotted with lawn signs. Some bear Rutland Welcomes’ logo: a simple white heart with a thin black arrow through its center. Please, come in. Others, residue from November, read “Make America Great Again.” Please, stay out. VRRP has arranged to house the families in apartments in or around downtown. They’ll see upscale restaurants on Center Street, Rutland’s pitch to tourists. They’ll see pickups and minivans parked in front of the mall—a Walmart and a Price Chopper and a Dollar Tree. A railroad track snakes behind the superstores—a remnant of Rutland’s industrial past. This will be their window on America. Like so much of the rest of the country, Rutland is struggling to figure out who it is and just how welcoming it wants to be. Over a single weekend in November, I heard residents call Rutland “Rutvegas,” a “backwater town,” “the Rust Belt of Vermont,” the “solar capital of New England,” “boring,” “poor,” “magical,” a “conservative bastion in a very blue state,” “welcoming,” “biased and racist,” “inclusive.” A “genuine town” that is “constant” and “slow-changing.” This little Vermont city turns out to be a microcosm of today’s fractured America. How Rutland sees its present depends on how it sees its past, and in January, Rutland will face its future. On November 16, 2015, Vermont Governor Peter Shumlin announced that Vermont would gladly welcome Syrian refugees amidst a swarm of other governors proclaiming the contrary. In Rutland, Mayor Christopher Louras saw an opportunity “to do the right thing and to rebuild our community.” He texted the governor: How could Rutland get involved? In December 2015, he met with Amila Merdzanovic, director of the Vermont Refugee Resettlement Program. VRRP had been relocating refugees all over Vermont for 36 years; in 2015, for instance, they resettled 312 new arrivals in Burlington and Winooski. But they’d never worked with Syrians, and they’d never worked in Rutland. Merdzanovic agreed with Louras: the city seemed a good fit. She spoke with community business leaders, who said there were entry-level jobs available—at the hospital, for example—and no one to take them. Housing wouldn’t be a problem: Rutland still has stock for 19,000, a remnant of the city’s glory days. And the public school superintendent, Mary Moran, reckoned Rutland could handle the extra burden of English Language Learning (ELL) classes without breaking the bank. The more Rutlanders Merdzanovic met with, though, the less she worried. “What we have come across is consistent support,” she said on April 26, when she and Louras stood before a crowd of press and citizens in the wood paneled Board of Aldermen room in City Hall. Louras announced that in a few months, Rutland was to become a host community for Syrian refugees in Vermont. One hundred individuals would come each year (once a resettlement program begins, it has no hard end date). Rutlanders use their town’s history as a bargaining chip. Some, like mayor Louras, compare the refugees to the wave of immigrants who arrived in Rutland a century ago and argue that they will be the boost that their aging town needs. Others, though, place their immigrant ancestors on high, out of reach. Those immigrants came to work and assimilate; these immigrants, just the opposite. In 1906, a young Greek named Nicolas Louras journeyed to America, seeking refuge from the Ottoman Turks. Louras quickly found work in a creamery in Bellows Falls, Vermont, but he always noticed the railroad cars that passed through his town. RUTLAND, they said in bold lettering. He figured Rutland must be the big city. And so he upped and went. Louras wasn’t alone. From the 1850s all the way through the 1920s, thousands of immigrants from tens of countries came to Rutland seeking a job and a home. Construction of five railroad lines in 1849 blew open Rutland’s marble industry. To build those railroads, contractors hired Irishmen. When the job was done, the Irish decided to stay, and sent for their families from New York and Boston. The Irish were soon joined by French-Canadians; then Swedes and Poles; then, at the turn of the century, Italians and Greeks; then a smattering of Finns, Hungarians, and Czechs. In 1870, one Rutland minister proclaimed in a speech: “Wealth has been sleeping under your fields, waiting only for skill and labor to come with the mallet and the chisel and awaken it into beautiful forms.… [Rutland] is fast becoming a new thing.” By the time Nicolas Louras followed the railroad to Rutland during World War I, skill and labor had arrived, courtesy of immigrants. One month after Mayor Louras announced Rutland’s resettlement program, the Rutland Board of Aldermen held a special meeting to talk about refugees. Merdzanovic drove down from her VRRP office to take questions. Over a hundred Rutlanders showed up. The audience and the Board of Aldermen proceeded to grill Merdzanovic. Many were furious that VRRP had foisted refugees upon them without their consent. “[VRRP] decided to force feed us something [they] weren’t sure we’d like the taste of,” Scott Tommola, a young Alderman, said to rousing applause. As the meeting dragged on into its fourth hour, though, it became clear that some citizens just didn’t want the refugees coming, transparency be damned. One Rutlander asked if refugees could buy guns. Another wondered aloud if Rutland would allow Sharia law. Rutland resident Dave Trapeni asked Merdzanovic—to laughter and applause—what kind of opposition it would take to scuttle the resettlement program altogether. Merdzanovic drove home from the Aldermen meeting “traumatiz[ed].” She came to Vermont as a refugee herself, fleeing from Sarajevo to Zagreb to America. She arrived a “free case”—no family, no friends in the States. Like Rutland’s early immigrants, she worked her way up, first at a farmers market, then a bakery. Once her English was good enough, she went to college. Today, she runs the organization that settled her twenty years ago. Her voice, deep and calm, reveals only the faintest wisps of an accent. She calls herself a Vermonter. Dave Trapeni represents the extreme pole of anti-refugee sentiment in Rutland. He is a leading member of Rutland First, an informal group of citizens who, for one reason or another, are worried about the presence of refugees in their city. True to his word at the Aldermen meeting, Trapeni spent the summer gathering over 1,200 signatures for a petition to force a city-wide referendum on refugee resettlement. The 11-member Board voted 6-4 in favor of the referendum—one vote shy of the seven required to put it on the ballot. To be clear: Not every Rutland First member shares Trapeni’s open racism. But they do all share his view of Rutland’s history. They remember a time when there were more railroads, more factories, more people. When immigrants integrated seamlessly while working good honest jobs. They have very few good things to say about today’s Rutland. With immigrants came tense clashes of religion, education, and language. The Irish clung to their Catholicism and refused to send their children to public schools run by Protestants. Rutlanders didn’t want a fight, and in 1865 the town voted to finance a Catholic school for Catholic immigrant children. Until 1953, the West Rutland Lutheran church held three of its weekly services in Swedish. In 1907, the Polish community founded its own school as well. Twenty-eight Polish children took classes in Polish from a Polish seminarian. Native Rutlanders were concerned about letting their new neighbors retreat to their native tongues and native churches. But not that concerned. The financial impact of immigrants, thanks in large part to their work on the railroad and in the quarries, was enormous. Rutland’s population doubled, then tripled. Land that sold for $60 an acre in 1845 went for $3,000 by 1870. Forty-five trains, freight and passenger, rolled through the city each day. With immigration, Rutland boomed. When Nicolas Louras got off one of those 45 daily trains, he chose the non-industrial immigrant path and opened small businesses: a shoeshine parlor and a fruit stand. He arranged to have a Greek bride sent over. But when Amalia arrived in August 1920, Nicolas refused to take time off from his store to marry her. The two waited until Labor Day to hold their wedding. As Rutland First stormed Aldermen meetings, a group called Rutland Welcomes formed spontaneously on Facebook. These were pro-refugee Rutlanders who wanted to help in whatever way they could. During the summer, they mustered over a thousand volunteers. They built a website. They organized educational events. They filled warehouses with donations from across Vermont: furniture, food, school supplies, toiletry kits, household bits and bobs (someone even donated a few bars of homemade soap). Most recently, they’ve begun to offer Arabic classes every Thursday evening. But Rutland didn’t say no. On September 28, Louras announced that the State Department had formally accepted Rutland’s application to be a host city. The refugees are on their way, whether Rutlanders like it or not. Unfortunately, the once extensive industry that brought such diversity to Rutland was largely a memory as well. Marble quarries petered out. In 1953, the Rutland Railroad’s passenger service on which so many immigrants had arrived ceased entirely. A strike and lockout in 1960 killed the freight trains, too. The railroads lay abandoned. In the 1996, Amtrak resurrected a daily passenger line to New York City—the track that today runs just behind the mall—but that was hardly enough. It’s here, listening to Mayor Louras, that I realize Rutland First and Rutland Welcomes want the same thing. Both crave a way out of Rutland’s post-industrial malaise. For Rutland First, that means a return to a single, perfect, and perhaps imaginary moment: before industry left, but after immigrants turned American. A tiny fragment of Rutland’s past when, as one resident so wistfully put it, “it felt as though everything were complete.” And for Rutland Welcomes, revitalizing their city means starting over from scratch: a new dose of hard-working foreigners, an injection of youth and culture into a community that lacks both. I know Rutland well. I’ve spent summers and winters in East Wallingford, 20 minutes away, since I was 10, and I was there this past summer, too, right in the heat of the refugee debate. When I returned on the weekend of November 5, the city seemed peaceful. The debate was over. Rutland Welcomes was ready. But—as was surely the case in every American town that weekend—every conversation felt tinged with unease. No one could remember a national election where the stakes were so tangibly local. That conversation took place on November 7. What happens when Rutland meets its refugees? Mayor Louras insists that a President Trump changes nothing. He points to Rutland City’s vote as a good sign: 53.2 percent Clinton, 41.6 percent Trump. But Rutland Town (the area that immediately surrounds Rutland City) went 49.4 percent Clinton, 45.3 percent Trump. West Rutland (just west of downtown): 55.4 percent Trump, 39.6 percent Clinton. What will it be like for the refugees to walk through their new home knowing at least four of every ten people they see voted for a candidate who wanted to ban them from coming? At places like the winter farmer’s market on West Street, just past the downtown mall and Amtrak station, they’ll find some friendly faces. They’ll see Carol Tashie selling vegetables. They’ll probably see Hunter Berryhill, too. He and Carol will smile and wave and greet their new neighbors. Merdzanovic still remembers people coming up to her on the street when she first arrived from Bosnia in 1995. “Hi, how are you!” they said. “That’s Vermont,” she laughs. But they’ll also see Robert Ayres, an egg-and-dairy farmer with a Trump hat. He thinks it’s probably important to take care of the refugees, but still says that, “We shouldn’t just open the door and let ‘em come in.” At the Price Chopper in the downtown mall, one cashier told me the refugees “scared her.” Another said she couldn’t wait to meet them. Across the mall at Walmart, Joey the Walmart associate says he thinks the refugees are probably alright, but he doesn’t want them taking welfare from our homeless veterans. These folks aren’t Rutland First; they aren’t Rutland Welcomes. They don’t know what to think. The refugees are something new, and that makes them hopeful—but worried. As I write, I feel less certain. What I’ve seen in Rutland is no surprise. It’s what Americans saw on fancy TV election maps on November 8. A confused country. A citizenry unsure of what to make of its future. Unsure of what to draw from its past. If that past tells us anything, it’s this: When the refugees arrive in Rutland, they will be subject to that same prejudice and obloquy which invariably attends a stranger in a foreign land. This time, the looks and remarks might be uglier than usual. On January 20, they’ll watch thousands of red hats cheer as that prejudice and obloquy enters the White House. A determined mayor and a small army of open-armed volunteers can (and will) be there to help, but only so much. Unfair though it is—and it is so unfair—the refugees will have to win Rutland over. It will be up to them to remind their new neighbors—Americans—of simple truths we’ve somehow forgotten. We all do want the same thing for Rutland; for our country. But to get there, we don’t get to cherry-pick our favorite piece of history. 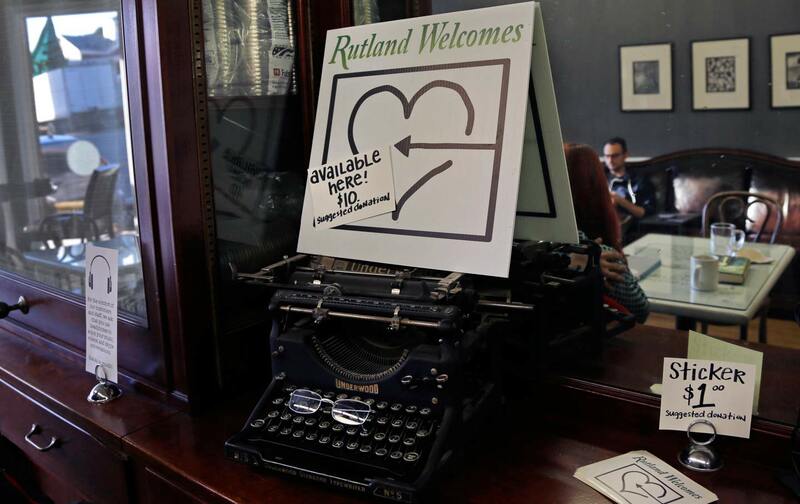 In order to put Rutland first, Rutland has always needed to welcome. And to the refugees arriving in the coming weeks: Before all this—before the lawn signs and farmers’ markets and contested histories—I imagine the first thing you’ll notice in Rutland will be the cold. Amila tells me this is the first big surprise for refugees. January in Vermont! It is a wonderful cold. It is Robert Hayden’s blueblack cold, fitting of a place where fathers still make fires with cracked hands that ache from labor in the weekday weather. Vermont in the winter bares a skeletal beauty, her mountains stripped of their green to reveal a twiggy, tangled skyline of branches that grasp hopelessly at the sun, like fingers at rushing water. Let the cold, the mountains, the small pockets of houses that fleck the sides of unfrequented highways—let them embrace you as you are driven to Rutland. It is, I would imagine, your first glimpse of America. Worth savoring, even today. Editor’s note: An earlier version of this article stated that Scott Tommola “switched sides” on the refugee debate. A critic of the resettlement plan, Tommola maintains that he did not oppose Rutland resettling refugees. Daniel JudtDaniel Judt is a graduate student in political theory at Oxford University.